Greetings Northeast Lincoln! This month I had the pleasure of attending the Wreaths Across America ceremony in the Warned Chamber. 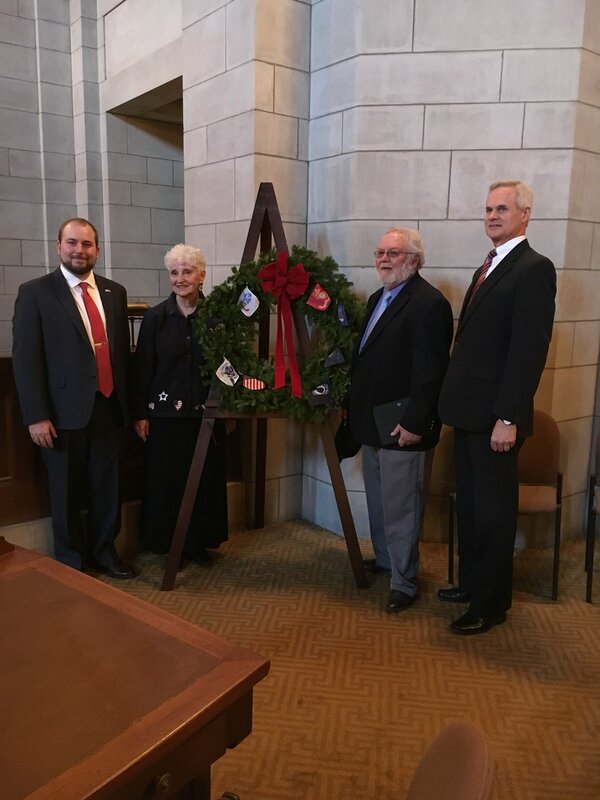 I was presented with a wreath honoring veterans, and accepted it on behalf of the Nebraska Legislature. The tradition of laying wreaths began in 1992, when the Worcester Wreath Company in Maine donated 5,000 wreaths to be placed on headstones at the Arlington Cemetery. As part of the program, Wreaths Across America sends a wreath to each state capitol to honor veterans during the holiday season. Over 1,000 locations around the nation participate in this event. This was the sixth year that Lincoln has participated. On Saturday, December 12th, Wyuka Cemetery will host another ceremony, where over 600 wreaths will be placed on the graves of veterans in the Soldier Circle. Honoring veterans at the Wreaths Across America ceremony, with Diane Bartels, Ralph Bierman, and Lieutenant Governor Mike Foley. The 2016 Legislative Session will begin on Wednesday, January 6th. The Nebraska Constitution requires that the Legislature convene annually on the first Wednesday after the first Monday in January. Sessions in odd-numbered years last 90 days, and those in even-numbered years last 60. During this short session, the first three days will consist mainly of bill introductions. Additionally, on the first day of session, the Legislature will elect a Retirement Committee Chair, a position that became vacant with the resignation of Senator Nordquist. While there has been some rearranging of committee positions, I remain on the General Affairs committee; Government, Military, and Veterans Affairs committee and the Urban Affairs committee. The ACCESSNebraska Special Investigative Committee has made its final report to the Legislature for the year. The committee finds that ACCESSNebraska has seen significant improvement over the last several months. Many changes made to the system under the new administration should be attributable to these improvements; recognition by officials of the operational challenges plaguing ACCESSNebraska allowed DHHS to make necessary modifications. These include the creation of targeted lists and work groups which have helped the system rise from the critical stage it was formerly in. Additionally, allowing for the cross-sharing of documents between Economic Assistance and Medicaid and Long-Term Care has enabled clients to cut down on the amount of paperwork they must complete. It’s also important to recognize ACCESSNebraska’s long-term employees, who have continued to work hard through additional training and overtime hours, and continue to advocate for the ACCESSNebraska program. The committee recommends that ACCESNebraska officials continue to explore funding opportunities that would allow the system to update its technology, to support the changing needs of social assistance programs. The committee does not recommend any related legislation, but does recommend at least one more year of legislative oversight. 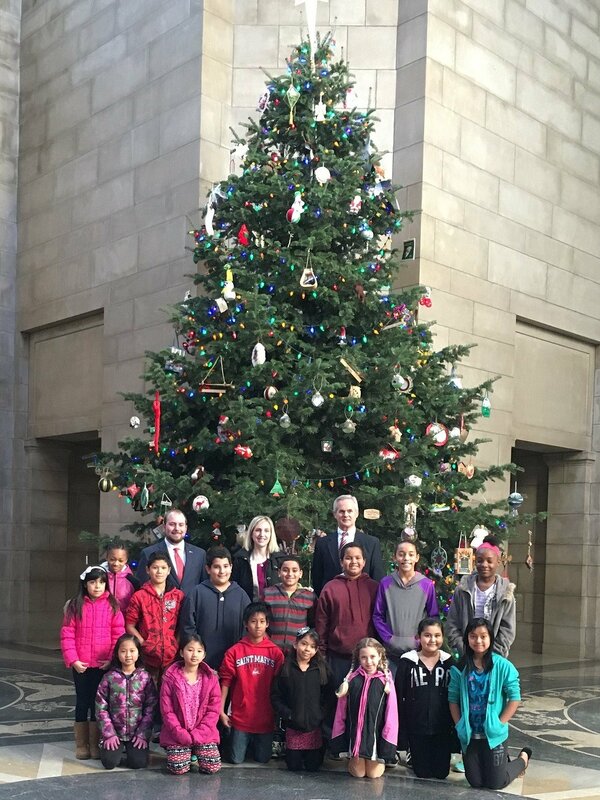 Fifth and sixth grade students from McPhee Elementary School attended the Wreaths Across America ceremony with their principal. With the start of the new year, our office will begin sending out newsletters at the end of the month rather than the beginning, as we’ve done in the past. ACCESSNebraska began a metric reporting program in April to measure the system’s functionality. At the first hearing of the session, on July 17th, DHHS shared ACCESSNebraska performance metrics for the months of May and June. The most recent published metrics provided are for the month of September. The metrics from September show a continued performance improvement in most categories. On the Economic Assistance (EA) side, both expedited and non-expedited applications are meeting federal standards of processing timeliness. Also on the EA side, metrics show a major decrease in average call wait times since June- from 23 minutes and 10 seconds to 4 minutes and 48 seconds. The chart below shows that ACCESSNebraska has surpassed their target goal. ACCESSNebraska Performance Metrics, September, 2015. In addition to these successes, Nebraska’s newest ranking in federal SNAP application processing timeliness has improved- from 48th to 39th. On the Medicaid side, application timeliness for Children and Families, and the Aged and Disabled has improved since April to exceed federal standards. Medicaid has seen continual decreases in total enrollment and Children and Families enrollment since March. However, this September broke the trend with both categories seeing an increase of over 1,000 individuals. Aged and Disabled enrollment has also grown over the last two months. There are only two categories in which Nebraska is not exceeding the federal standard; both are related to SNAP. Nebraska’s denial accuracy rate for SNAP falls short of the federal standard, which is around 95 percent. However, Nebraska’s rate is substantially higher than the national average, hovering between 75-80 percent. In SNAP application processing timeliness, Nebraska falls short of the federal standard and the national average. In September, the ACCESSNebraska Special Investigative Committee toured the Lexington and Scottsbluff offices. In October and November, we will be touring the Fremont call center and Lincoln imaging center. Greetings Northeast Lincoln! This September, the capitol tower will shine red for Hunger Action Month. The tower lighting was sponsored by the Food Bank for the Heartland and Lincoln, a non-profit organization that delivers food to schools, pantries, and shelters from Nebraska to Western Iowa. The office of the Capitol Commission invites you to view Lincoln’s changing colors from the tower’s observation decks. They are open during public hours, and are accessible via the northeast elevator. To see the capitol’s public hours, go to capitol.nebraska.gov. Over the course of the summer, I had the pleasure of attending two legislative conferences. The Council for State Governments (CGS) held it’s Midwest Meeting at the event center in Bismarck, North Dakota, and the National Council of State Legislators (NCSL) Summit was held in Seattle, Washington. NCSL is a bipartisan organization that provides research and technical assistance to legislators and staff. Prior to the Summit, I was appointed to NCSL’s Legislative Effectiveness standing committee to examine practices, procedures, and strategies promoting effectiveness among legislatures. The committee’s next meeting will be this December in Washington, D.C.
Interim hearings have been scheduled for General and Urban Affairs Committees. General Affairs will meet on September 25th and October 23rd. In September, the committee will hear LR288 and LR290, examining issues related to public libraries, and LR307, examining issues that fall under General Affairs’ jurisdiction. In October, the committee will review LR287, examining licensure of craft breweries, and LR289, examining UNL alcohol policies. The Urban Affairs committee has scheduled hearings on September 25th, October 23rd, and November 5th. The first hearing will address two resolutions: LR512, examining the Local Option Municipal Economic Development Act of 1991, and LR155, examining potential economic development tools for municipalities. In October, the committee will hear LR278, examining tools for municipalities to encourage neighborhood revitalization, and LR174, examining issues surrounding the Nebraska Energy Code. The third hearing will be held at the Lifelong Learning Center at Northeast Community College in Norfolk. The Government committee has not yet scheduled any fall hearings. However, two of my interim studies will be addressed in this committee. LR196 examines current statutes governing population thresholds while LR335 examines the Presidential Commission on Election Administration’s latest report. ACCESSNebraska’s first hearing of the session was held on July 17th. At the hearing, DHHS shared ACCESSNebraska performance metrics for the months of May and June. The metric program began recording in April to measure the system’s functionality. More recently, DHHS shared performance metrics for the month of July. July’s metrics show that most categories have seen performance improvements since April. On the Economic Assistance (EA) side, both expedited and non-expedited applications are meeting federal standards of processing timeliness. Also on the EA side, metrics show a major decrease in average call wait times since June- from 23 minutes and 10 seconds to 15 minutes and 51 seconds. Call wait times have not been this short since October of 2014. In addition to these successes, the number of Nebraskans enrolled in SNAP has increased in number of households and number of individuals for the last three months. On the Medicaid side, application timeliness for Children and Families, and the Aged and Disabled has improved to exceed federal standards. However, Medicaid has seen continual decreases in total enrollment, Children and Families enrollment, and Aged and disabled enrollment for the last four months. The next special investigative committee hearing has not yet been scheduled. On August 18th, Nicole Fox was sworn in to office by Governor Ricketts. Appointed by the Governor, she will represent LD 7, effectively replacing Jeremy Nordquist.. Senator Fox has been assigned to two committees: Health and Human Services, and Banking, Commerce & Insurance. Don’t miss the last University Place Community Market of the season on Wednesday, September 16th. The market will have produce, food, and crafts, from 3-7pm at 48th and Madison streets. On September 19th, Speak Truth to Sexual Violence is sponsoring an Assault Awareness Rally at noon on the North Plaza. The Nebraska Legislature is seeking Legislative Pages for the upcoming session. Call the Clerk’s office at (402) 471-5100 to request an application. Applications will be due by Wednesday, September 30th. Senator Hansen’s office is seeking an intern for the upcoming session. Please e-mail mhansen@leg.ne.gov for more information. Now that we have reached the interim, our office will not be sending out a monthly newsletter, but we will continue to keep you up-to date with less frequent newsletters. My staff will continue to be available to you during normal business hours. 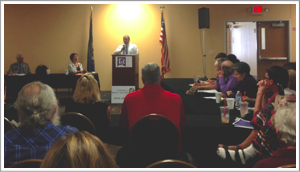 The ACCESSNebraska Special Investigative Committee had its first hearing of the year on Friday, July 17th. The committee invited several public employees and client advocates to testify, including DHHS’s new CEO, Courtney Phillips. Ms. Phillips assured the committee that DHHS has spent considerable time meeting with staff at call centers and local offices to gain insight and identify necessary improvements. Under new leadership, DHHS has taken steps to improve the ACCESSNebraska system. One improvement involves the creation of the ACCESSNebraska Dashboard. The dashboard demonstrates how ACCESSNebraska is doing in an easy-to-understand format, using metrics developed by DHHS to show successes and failures in the system. The dashboard is shown on ACCESSNebraska’s website, and is updated monthly. The current report is shown online along with an archive of past reports and a link to subscribe to the monthly updates. There are also plans to update the Nebraska Family On-Line Client user system (N-FOCUS) technology on the Medicaid side. In 2013, programs administered by ACCESSNebraska were split between two sides. The Medicaid and Long-Term Care (MLTC) side administers Medicaid and the Children’s Health Insurance Program (CHIP). The Children and Family Services (CFS) or Economic Assistance (EA) side administers SNAP (Supplemental Nutrition Assistance Program, formerly food stamps), ADC (Aid to Dependent Children), Aid to the Aged, Blind, and Disabled (AABD), the Nebraska Low Income Energy Assistance Program (LIHEAP), the Child Care Subsidy, the State Disability Program (SDP), the Social Service Block Grant (SSBG), and the Refugee Resettlement Program (RRP). DHHS has developed a Top 10 list of operational hurdles to overcome. The list includes reviewing mail operations to ensure mail goes out in a timely manner, reviewing policies to simplify processes for efficiency, and reviewing data requested for reports to ensure that the right information is being reported. DHHS will be analyzing workforce management to better handle work when it hits peak levels, and will also focus on the recruitment and retention of staff. DHHS seems to have acknowledged many of the concerns mentioned in testimony from outside organizations. Problems mentioned include a lack of available human resources, the too-old technology used in N-FOCUS, and that the confusion caused by separating MLTC and CFS has caused people to miss out on benefits they’re eligible for. The committee will continue to provide oversight to ACCESSNebraska’s progress. The next hearing will likely be later this fall.